In 2015, the City of Edmonton sent out more than 85,000 letters to registered property owners informing them of proposed rezonings and development projects, including public meeting notices. In an effort to both reduce costs associated with preparing community notices and communicate more effectively with residents, the City moved to postcard notifications in May of 2016. The postcard format provides information that’s easier to understand. A basic version of the same key information from the letter is still included on the postcard. While the size of the postcard limits the amount of information we can provide, you will still have the ability to easily get more details, if you wish to do so. For very complex (area or neighbourhood plans) amendments, the City will continue to send notifications in the standard letter format, since the maps are too detailed to fit into the space on the postcard. What Information is on the Postcards? 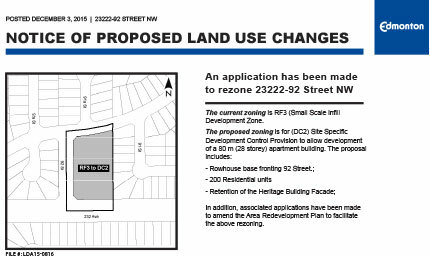 All rezoning application notifications will have the related address (or addresses) listed for easy reference when calling the planner or using maps.edmonton.ca for more information. See below for details on using the City’s map tool for zoning information. A small map and a brief explanation of the location is provided to help you identify where in your neighbourhood the project is located. The postcards offer a brief description of the project and contact information for the planner assigned to the project. All hearing/open house/public meeting postcards include a meeting or hearing date, time and location where citizens can obtain more information and/or make comments on the proposal. If you are unable to attend, comments can be made by emailing the planner assigned to the project, or by calling 311.